I don’t know a great deal about the technical carcinogenesis of cancer. I am a liberal arts student with interests in history and language. I have studied the epic battles of the centuries and read countless stories of human bravery and triumph. I have read detailed accounts of fierce villains and conquistadors decimating entire villages and the diaries of survivors who moved on to new homes and new lives. Stories of the courage and perseverance of small bands of hapless warriors and private citizens meeting the enemy at the gate are repeated many times over through the course of history. These stories share a certain commonality with those individuals who move through their daily lives fighting their personal “enemy at the gate” – cancer. The Parisians of August 1914 commandeered taxis and rode in mass to face down the Germans camped a mere nine miles from the entrance to their city. Armed with antiquated firearms, pitchforks and clubs they hoped to hold off the German forces until the regular French army could arrive. Surely the mission was doomed to failure and yet, each citizen believed there was a chance, the smallest possibility of success that made the venture worthwhile. That sense of possibility is the essence of a cancer sufferer’s survival. No matter what the odds, the prize of another day of living; perhaps even to beat the enemy and wake one day cancer-free is worth the pain and potential debilitation of treatment. Every advance in treatment, and each dollar spent on research is another thread binding the cancer sufferer to life and to hope. I have seen my friends and loved ones survive on this whisper of possibility for months and years beyond their doctors’ expectations. It is this acceptance of possibility and hope that becomes the most courageous of personal actions. I watched a student in my high school battle his cancer every day. We shared a homeroom and while he couldn’t participate in sports and was a haphazard student, he became a beacon of positive action for his peers. He was diagnosed with an inoperable brain tumor when he was ten years old and by the time he had reached his junior year, he had also reached the stage IV level in the progression of his disease and was often afflicted with neuropathic symptoms and pain, but my fellow school mate rarely missed school. He could be seen selling jeans day tickets every Wednesday and setting up for dances. He tutored in the after school program and helped with our Feed the Hungry programs on the weekends. He had long since lost his hair which never grew back and always wore a Cleveland Indians ball cap. While I was too young to fully comprehend the exhausting rounds of chemo and radiation therapy that he was receiving just to regulate the growth of the deadly tumor growing inside his head, I was aware that his attitude toward his cancer was part of his life sustaining force. My friend and his ball cap will forever be a symbol of courage and endurance should I ever have to meet this enemy at the gate. James Rhio O’Connor was diagnosed with pleural mesothelioma in October of 2001. His oncologist offered little in the way of hope. Surgery was not an option and chemotherapy would severely lessen his quality of life. Mr. O’Connor was determined to survive his one year prognosis and immediately began to research alternative treatment strategies. He became “the captain of his own ship” so to speak, studying diet and exercise regimens that had not been offered at the time of his diagnosis. O’Connor became an advocate of personal and proactive patient care: the patient in partnership with his clinicians. 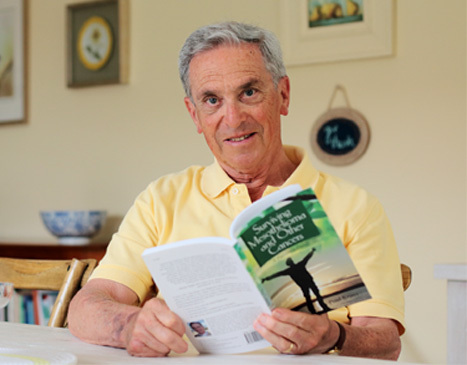 His exploration into mind and body therapies and his personal commitment to the continued possibility of life have become a triumphal banner to the cancer sufferer. O’Connor’s research provided him with another seven and a half years of living. The extension of his life beyond the expected one year prognosis is proof that knowledge and personal action are valuable weapons against cancer. My “Aunt Mary” was diagnosed with Stage III colorectal cancer in May of 2001 and while those who loved her sat wringing their hands and wailing over her fate, Aunt Mary was on the internet and then on the phone learning about her illness. Her journey of treatment and survival is part and parcel of my growing up years. Family members have travelled to New York, Pittsburgh, Pennsylvania, Texas, and Ohio with Mary to visit treatment centers and the possibility of new and alternative treatments. Mary called these visits “strategic remission planning” and some were briefly successful. Because Mary is often the life of the party, we have generally planned family events and holiday celebrations to avoid the days following chemotherapy and radiation treatments. Her journey with cancer has been remarkable and will be remembered as much for her holiday decorated portable chemo-packs and fashion wig accessories, as well as the more difficult times of illness and debilitation. Mary never met James O’Connor, but she has lived his challenge to the fullest. Her belief in her own ability to research and direct her care, to ask questions and pursue the answers has sustained her for many years. Acquaintance with courage and positive action in the face of great danger is more than the stuff of historical heroes. I have learned the potential of hope whispered through quiet desperation. I have witnessed the strength and determined quests of individuals committed to their own personal survival as well as their journey to provide answers for those who may follow. John Kanzius is well known in my home town of Erie, Pennsylvania as an inventor and cancer fighter. His own diagnosis of non-Hodgkin’s Lymphoma led him to experiment with radio waves to kill cancer cells. His experiments have been successfully tested in Pittsburgh and continued research may someday provide life saving treatment to cancer sufferers. James Rhio O’Connor, John Kanzius, my former schoolmate, and my Aunt Mary are my teachers and my heroes. And while I cannot name a specific path I would venture upon if I was called to walk in their shoes, I know that I could call upon their example to guide my actions. I will hope to beat the odds as they did with research and a commitment to understanding treatments and alternative disease strategies. I will not cower before “the enemy at the gate.” I will believe in even the smallest possibilities and I will work for others to do the same through continued support of research facilities and the publication of their amazing works so that others may also have hope when called to their “testing point.” O’Connor’s story, partnered with my very own observations of close friends and family struggling with cancer, has helped me to understand the value of perseverance and hope. We exist and thrive today because we are designed to adapt and to urge ahead. If man had been created to settle, we would not be here today. If “Rhio” had settled for what someone else believed or what someone else had said, he would not have defied the odds. I know now that “the odds” are what you make them.